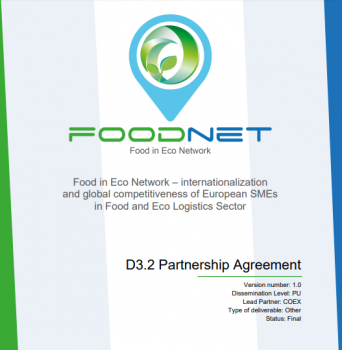 Partnership Agreement, the constitutive document for the Food In Eco Network (FoodNet Meta-cluster) is already prepared and has been uploaded to our project website. It will help all organizations interested to join our Partnership to achieve clear and complete information on the cluster’s mission, vision, strategic goals, its legal form, membership options, the organisation of the work, decision making and authorities of the FoodNet organisation as well as financing aspects. The document is based on the survey of critical success factors for an EU meta-cluster conducted within 52 clusters’ managers, 111 SMEs and other relevant stakeholders. Full results of the research are presented in the Deliverable D3.1 “Success factors for an EU meta-cluster” also available at the project website – in the same “Documents / Reports” section. The FoodNet Meta-cluster partnership has been officially launched during the 1st FoodNet conference in November 2018 by a group of five clusters. It is expected that at least 25 more will join the Partnership by the end of the project in December 2019.